I've used this play successfully for a 3rd and 4th grade youth team. I also run it with 2 making a v-cut and receiving the ball and 1 going on a give and go either to the lane or to the base line. 3 can also set a pick for 2 if he doesn't receive the pass. 1. The point guard, 1, brings the ball up and calls the play. 2. The guard on the ball side, 2, sets a pick for 1. 3. 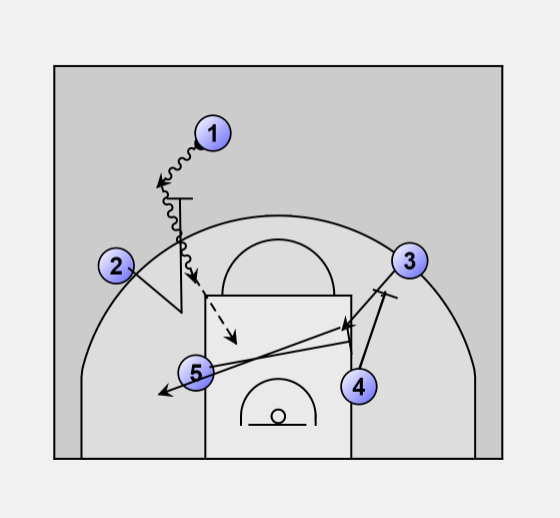 The forward on the weak side sets a pick up high for 3 on the wing. 5. 5 sets another pick for 3 near the lane. 3 shouldn't cut to the basket, but across the lane all the way to the other side of the lane, looking for the pass all the way, or he can post up in the lane or screen for 1's drive. 7. 4 rolls after he picks and can be open for a pass in the lane and 5 rolls to the basket to rebound, 2 hangs back to prevent fast break.